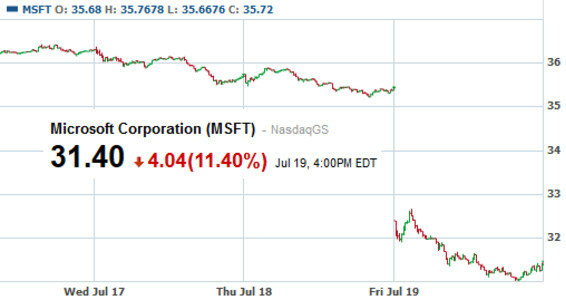 Shares of Microsoft plunged 11.4% on Friday, closing down $4.04 to $31.40. For Microsoft, it was the sharpest one-day decline of the company's shares in 11 years and came after the company reported its quarterly earnings. Yes, Microsoft earned nearly $5 billion for the three month period, but a $900 million write-off of Microsoft Surface RT tablets held in inventory rattled investors along with a gigantic 16 cents a share earnings shortfall for the quarter. The Redmond based software giant reported 59 cents a share in earnings while Wall Street's consensus was for 75 cents. If you are a contrarian, here is a stat of interest. As recently as April, 60% of the analysts covering the stock had a 'buy' signal on the shares. Today, that number is down to 25% which is a 20 year low. Of course, the earnings miss didn't help in that department. It was the biggest gap the company had between reported and estimated earnings over 38 quarters. You have to go back to January 2004 for the last time Microsoft disappointed the Street so badly with its quarterly numbers. Microsoft CEO Steve Ballmer tried to get traders to look at the future of the Surface tablets instead of the past. He said, "We are working hard to deliver compelling new devices and high value experiences from Microsoft and our partners in the coming months, including new Windows 8.1 tablets and PCs." The retail price of the Microsoft Surface RT had been recently slashed by as much as 30% to $349 for the 32GB model and $449 for the 64GB slate. MS will continue to disappoint until Steve is replaced. The guy just doesn't get the shift to mobile. Win RT is just such a joke. And the best Steve can do is to say we are hard at work on the future? Puhlease. I totally agree with you Dougie, Steve the Balld'mess screwed up Windows Mobile and then he set his sights on Windows!! I just installed Windows 8 Pro on a partition: OMG, what a mangled mess!! Oy Vey !!!!!! I couldnt agree with your more on Windows 8. I had to google how to go to the Settings, My computers and even how to Turn Off computer!!! lol .. It took me awhile last night fiddling with the limited and contrived UI but I was able to find the same two without Googling. My only thought, damn the people who aren't technically inclined will definitely need expert help in configuring their desktop unless, of course, they just plan to use those horrid tiles and never plan to make any extensive changes to their system. Horrible!! Hesus Christmas! I just got a custom build in, added a bluray drive and changed out the HSF with a Noctua NH-u14s, put in a clean install of 8 Pro. I friggin hate it! It takes two to three times as many clicks to do anything. It does boot fast, though. I don't get why so much people hate Window 8. I think Its a direct upgrade from Windows 7. Also anyone who knows how to use YouTube or Google or Bing,... can easily bring back the Start Menu or Aero or other features missing from Windows 7 or skip Metro and the Start screen. Only losers hate them, because they dont want to learn something new. I have repeated this rant a lot. This stock plunge is due to RT failing to sell well, not desktop windows 8 which is doing fairly well. IMO Windows RT never needed to exist in the first place - just stuff in full windows 8 on a tablet, even Acer can do it on a 8 inch tablet. New does not necessarily mean better. And rant is all that is. It's not about learning new things, it's about hating what they've done with Windows. 8 is a mess for desktop use. Might be great on a phone but it's too busy for a PC. That is true, but what kind of innovation do you expect? A computer could do almost anything we want it to already, as long you have the appropriate software to go along with your needs - the limiting factor being the amount of specs you have. Want something fancy like Tony Stark has in the Ironman movies? And @Sakuraakino, as i said, too many people are lazy to learn and blame it on others (such as the interface being too different). In terms of rate of windows 8 sales over a period of time, it is close to windows 7. You can't see any innovation because there are no competitions!! To MS, STOP MONOPOLY!! You guys said it in smartphone OS wars - apps are important, and many brag about the sheer quantity of apps without looking at the quality. If quantity is more important than quality, Windows is just the same. The sheer number softwares are unmatched. Thats why Android is doing well as the major smartphone OS, and that's also why windows is doing well as a desktop OS. So, according to your logic, i could also shout out "Google, please stop the Monopoly (in smartphone OSes)". There are many players in smartphone markets... Android, iOS, WP, BB etc. At least Android are not monopoly in smartphone segments for more than 2 decades!! You know what... Competition leads to innovation. That is very true. The problem is, no other OSes have that much software as Windows do. The only 2nd option after Windows is Mac, and Macs are very expensive outside USA. Linux is not something many people use, and even as a tech geek i dont know much about it yet, not to mention i have yet to see even a friend or relative using it. And, as people grow accustomed to windows for productivity purposes they wouldnt want to switch to another OS unless it offers as much as windows does in flexibility and software - and they fear change and learning. Many people are lazy to learn and change, which is also why some people hate windows 8. People want to stick to the same thing with minimal changes. Are you mental, it's probably a "direct upgrade" for someone suffering from Schizophrenia with delusional features!! This is not speculation, it's Microsoft in a tailspin. The desktop market is moribund, and contracting because most people have realized they don't need one for daily use, "ultrabooks" are bad MBA ripoffs, so you may as well buy the MBA, and the only MSFT division that was truly healthy, the XBox division, just mucked up their path forward. They have a mobile OS not enough care about, a desktop OS consumers don't need, a search engine and browser people joke about, and an entertainment console that will be a huge flop. Microsoft is in BIG trouble. Bill gates is not devil dude. He is really great guy. Honestly just get rid of RT and just make Pro the best of both worlds. +1 for you sir. Also need to make Win 8.1 a better version of windows. What is with the stupid 'compatibility' mode? It seems every site on the Web with any bit of Flash content is opened in compatibility mode - including PAs site.